This is the White Samurai Katana Full Tang Ninja Sword. The blade has been constructed from 440 Stainless Steel. Red special forces symbol has been added to the blade. The actual guard is a steel disc with a cut out design. 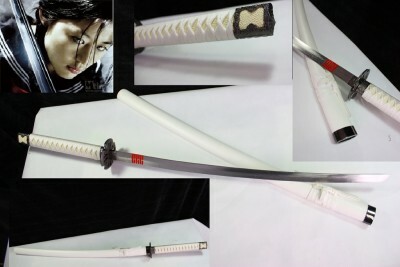 This is the White Snake Eyes / Storm Shadow Samurai Katana Full Tang Ninja Sword. The blade has been constructed from 440 Stainless Steel. Snake-Eyes' red symbol has been added to the blade. The actual guard is a steel disc with a cut out design. Silent and Mysterious, this skilled ninja wears a visor that conceals his face. The white Snake Eyes katana features a 440 stainless steel factory sharp blade with partially serrated, etched G.I. Joe emblem, and a unique lightweight skeletonized handle design. The handle is made ofwhite wood. This sword is precisely replicated from the actual movie prop and includes a white rough finish wood scabbard. This sword will put that touch of class to your GI Joe Collections. Free Economy Shipping to the all of the lower 48 US states only! We prefer Pay Pal but will accept all credit card payments. Please note to all credit cards buyer a Pay Pal account is NOT needed to make your credit card payment, but you must checkout through Pay Pal. If other payment options are needed such as M.O., C.C. or P.C. we do accept these payments please contact us on how you can pay by these methods if needed BAR-3278.